5 actions we can take to make a difference. I’ve never thought of my bedside table as being indicative of my state of mind however, as I look at it from across the room, I know this to be true. Today my bedside is filled with self-help books that are spilling off the edges and gathering in a pool on the floor just waiting to be read. When I started thinking about why this is, I realize that the past year and a half of my life has been filled with uncertainty and now that it is combined with a tenuous political climate it challenges my philosophy of living with a green heart on a daily basis. Like many I turn to self help books in times of trouble hoping for an answer. Some of these books were given to me by friends. Some of these books are written by friends. And some of these books I bought myself. Among the titles are Daring Greatly by Brene Brown, Big Magic: Creative Living Beyond Fear by Elizabeth Gilbert, Wake Up To The Joy Of You by Agapi Stassinopoulos, A Yogi’s Guide to Joy by Sadguru, Thrive by Arianna Huffington and PeaceQ by Jennifer Freed. These all help to keep my outlook positive including the blog I read the other day by Joanne Tombrakos on how to stay positive when the world seems so scary. When the news feeds are filled with reports of the Trump Administration directives to the EPA to rescind or revise the Clean Water Rule which protects streams from pollution or Scott Pruitt’s decision to not ban chlorpyifos, a pesticide with links to harmful neurological effects and autism in children or the rollback of the Clean Power Plan, which beyond the damage to the climate it would cause, would statistically result in thousands of otherwise preventable deaths to Americans, I know that reading is not enough to maintain my balance and keep my attitude generally positive. If we’re all going to get sick from less environmental regulations, how can we be happy and have a thriving economy? It all seems like a complete oxymoron to me. A healthy population can withstand anything whereas if we’re in poor health, we become a burden to society. For me these issues should not be political. Clean air and water and the controls to prevent chemicals that are harmful to our health from making their way into our food, skin care and cosmetics are basic human rights to which we are all entitled. And now it feels like these rights are being threatened daily. With that brings a new challenge for me — how do I live with a green heart in the face of all of this and how can I help others. This goes beyond reading the labels on what you buy but that’s a good start and organizations like the Environmental Working Group provide great resources to help you, including their Health Living App. The other way to be a conscious consumer is be an ethical investor in funds like the one Calvert has, support companies like Apple and Anheuser Busch that are committed to sustainability, regardless of what this administration is doing to roll back controls and not to support those intent on destroying the environment. Grass root actions and making every purchase a sustainable one do make a difference! It can be as simple as refusing a plastic water bottle which cause enormous harm to the environment or bringing a reusable bag when you go grocery shopping. Choosing a shampoo that is not toxic to you or the environment or buying organic food may not seem like much, but small steps add up and can make a difference. 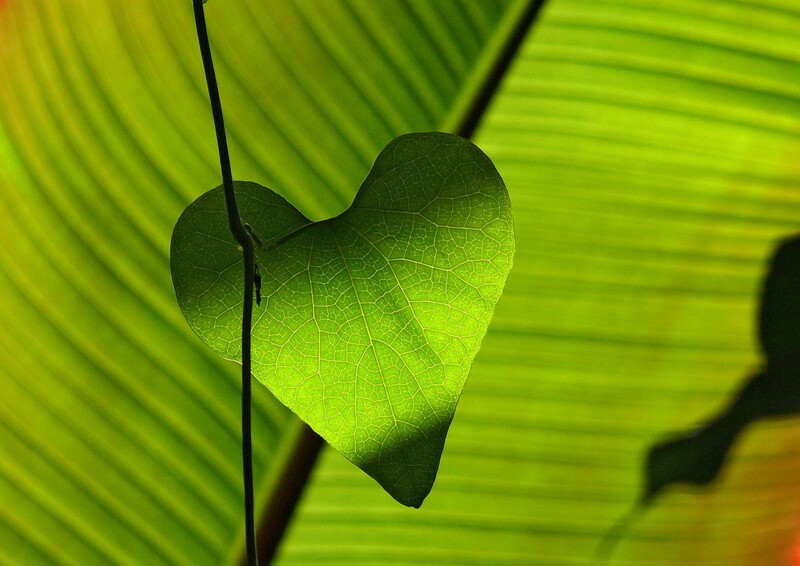 For me the act of living with a green heart implies self-care whether that’s eating a healthy plant-based diet or making time for yoga and meditation. That’s more important than ever in these challenging times. I need to think more thoughtfully about where I want to go, how I’m going to get there, as well as with whom I’m going. It also means that I need to be conscious and present in every moment of every day so I am aware of what is happening and can then better adjust my personal compass to accommodate the changing winds. General Electric CEO Jeff Immelt said he tries to stay out of politics and believes in working with and not against the government, but feels it necessary to address some of Trump’s policies including his rollback of environmental regulations. GE believes in protecting the environment and has done so successfully for the past 12 years with it’s environmental initiative called Ecomagination. Mars, Inc who makes M&Ms stated they were “disappointed the administration has decided to roll back climate regulations” and is still committed to eliminating its emissions entirely by 2040. But you don’t have to be running a large corporation to make your voice heard. Call your representatives and show your support for what they’re doing to help the environment. Attend a march like the one for Climate Change in Washington, DC on April 29 or donate to an environmental advocacy group like Kiss the Ground or Tree Huggers.